These multi-shaped macro-algae deserve their title as "most popular". It might sound bizarre, but these are the largest single-celled organisms in the world; and their so good-looking, they appear artificial (!). Caulerpas grow prolifically in established aquaria, often to the point that they have to be routinely thinned to prevent overcoming other tank inhabitants. Most Caulerpas look like creeping vines with alternating leaf-like projections emanating from their two-dimensional profiles. Their 'holdfast' organs provide anchorage in the gravel and on solid decor. As all the pieces tied together are of the same organism (actually all one cell), take care not to break off their interconnecting strands. This often results in the severed section disintegrating. Several of the seventy or so species are available through retail, mail order and culture facilities. The most popular are the changeable, grape-like Caulerpa racemosa, feathery Caulerpa sertularoides, Caulerpa taxifolia, and Caulerpa mexicana, and the solid-bladed Caulerpa prolifera. Caulerpa prolifera, likely the most common species (of many) in use in marine aquariums. Originates out of both coasts of the Atlantic in warm waters and the Mediterranean. 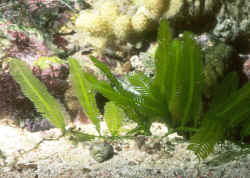 Caulerpa taxifolia, one of the best species of the best genus of algae for marine aquarium use; though an extreme pest when/where (mis) introduced in the wild. RELEASE NOTHING from your care into native habitats, EVEN if it occurs there naturally. Mixed w/ other, non-indigenous species, such introductions can easily spread contaminants, parasites, pathogens. Baugh, Thomas M. 1988. 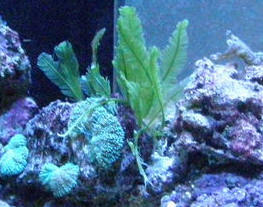 Caulerpa prolifera; an attractive species which does well in the marine aquarium. FAMA 5/88. Brawer, Marc. 1971. So you want to keep marine plants. Marine Aquarist 2(2):71. Brelig, Allen. 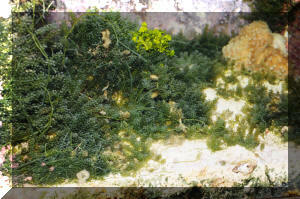 Plants in the reef system. FAMA 6/93. Caribaldi, Lou. 1973. Seaweeds are not weeds. Marine Aquarist 4(4):73. Giovanetti, Thomas A. 1989. Caulerpa enemy of the miniature reef aquarium? FAMA 10/89. Hoff, Frank. 1988. Coral reefs of Florida, part II; the algae. FAMA 1/88. Hoff, Frank H. 1983,84. Marine algae of the genus Caulerpa, parts 1,2. FAMA 10/83, 4/84. Jacobs, William P. 1994. Caulerpa; this tropical alga is the world's largest single-celled organism. yet it differentiates into a complex structure of leaves, stems and roots. Scientific American 12/94. Kraft, Herbert. 1959. A step forward for marine aquarists; Caulerpa prolifera, a plant for salt-water aquaria. TFH 5/59. Mancini, Alessandro, translated by Paolo Macedone. 1995. Tropical algae of the genus Caulerpa Lamouroux, 1809. FAMA 6/95. Mayland, Hans J. 1975. The leafy algae, Caulerpa prolifera. Marine Aquarist 6(4):75. Smit, George. 1987. The ecological marine aquarium, part four; the use and benefits of live rock and Caulerpa in marine aquariums. FAMA 8/87. Sprung, Julian. 1989. responding to questions re the sexual reproduction of Caulerpa in captive systems. FAMA 2/89. Thiel, Albert J. 1988. Keeping and growing marine macro-algae. FAMA 8/88. Tullock, John H. 1983. Growing marine 'plants'. FAMA 3/83. Wilkens, Peter. 1992. Green water in the aquarium; the sexual reproduction of Caulerpa algae. TFH 2/92.